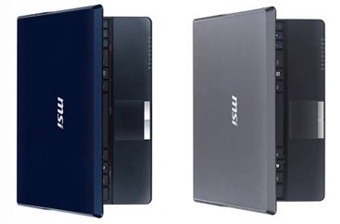 I heard a while ago that certain companies were cracking down on the use of the word “netbook”, but that hasn’t stopped MSI from announcing the U123 series. This Wind series includes the U123, the U123H, and the U123T. All models feature a 10-inch screen, and yet compact enough to fit in an A4-sized bag. Inside is the latest Atom platform CPU (the 1.66GHz Intel Atom N280) with HDD capacity of up to 160GB and 2GB of DRAM. Of course, what would these netbooks be without 802.11 b/g/n WiFi? The U123 series has it, and the U123H model has 3.5G mobile network cards. Other features include an integrated TV tuner that allows the user to watch and record TV programs by attaching an antenna. Another feature is the EasyFace Manager, which is an embedded webcam that scans the face of the user and can recognize the eyes, cheekbones, jaw line, and the nose. The user can store ten facial images, and Easy Face can also be used to Log on. So far, the official press release hasn’t said anything about the Wind series price or availability, but there is word that it will be available in colors such as pearl white, dolphin gray, midnight blue, and silver red.